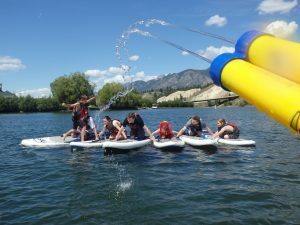 Adventure Paddle School, learn to whitewater kayak and stand up paddleboard in the heart of the Columbia Valley! Come learn to paddle with Adventure Paddle School! Whether you are interested in whitewater kayaking or stand up paddleboarding—who knows, you might get hooked! Adventure Paddle School’s main focus is to get people out on the river! We offer lessons to people of all abilities; from those who have never paddled before to those with great experience. Our paddling progressions will have you thinking you are the Michael Jordan of white water kayaking! We have a bunch of amazing SUP courses to offer this year including kids specific, teen specific and yoga for all! Check out our list of courses by clicking the link below. We are sure you will find something that suits you! Adventure Paddle School loves getting out on the water for a paddle and we want to share that passion with you. Paddling of any sort is a great way to stay healthy and keep a positive outlook on life.